The cornucopia of grade I stakes served up from coast to coast the last two weekends has offered racing fans great insight into the equine athletes preparing for the upcoming Breeders’ Cup World Championships at Churchill Downs. Taking a look at some of the tracks’ numbers—attendance and handle—offers the Thoroughbred industry some insight into the health of the racing game. Sun-drenched Keeneland drew 17,000-plus for its opening day program, Friday, Oct. 8, then drew 22,958 for five graded stakes the following day. Those are outstanding figures, considering the World Equestrian Games were still going on and the University of Kentucky football team hosted top 10 ranked Auburn that evening. For Zenyatta’s California farewell, more than 24,000 showed up Oct. 2 at Hollywood Park toting signs and giving last year’s Breeders’ Cup Classic (gr. I) winner a well-deserved, rousing send off. For those who did not have the good fortune of being there, the event did play well on ESPN, which carried about a 15-minute cut in during the early evening (Eastern time). At Belmont for Jockey Club Gold Cup day, a mere 9,671 were on hand for the live action. The following Saturday, 6,858 witnessed Uncle Mo’s Champagne Stakes (gr. I) and A Z Warrior take the Frizette (gr. I). Those numbers seem anemic, considering the New York metropolitan market is among the world’s largest and there appeared to be little competition from Major League Baseball or college football on either Saturday. On the other hand, handle figures for both Belmont cards showed strength and national interest in New York Racing Association “Super Saturdays.” National handle on Gold Cup day topped $18 million, and more than $12.5 million was wagered the following Saturday. At Belmont, attendance has flagged for years, caused perhaps in part by some of the malaise surrounding NYRA the last few years and more likely tied to the fact it’s much easier to sit at home and wager online while watching the races on a high-definition flat screen television. The strong handle figures support the theory that thousands of fans in “virtual attendance” are participating in the racing action while online. Naheem Ghazi, head of marketing for NYRA, is a smart fellow. He figures it would take a few million dollars to move the needle on ontrack attendance. No one has that kind of coin lying around these days. Even once NYRA’s slot parlor gets underway next year at Aqueduct, there are lots of bills and IOUs to pay back. He’s doubtful his marketing budget’s needle moves any time soon. These three different locations combined illustrate great interest in our sport. In New York a Wall Street attitude prevails. Average handle per person on track Oct. 9 was $179.55 and on Oct. 2 it was a robust $222.64. With a heavy party atmosphere in a “tailgating” section at Keeneland for the college crowd, a day at the races in Lexington is more of a social event. The average handle per person Oct. 9 was a scant $75.45. The hope here is that these students submit their applications for the Keeneland Club after graduation. In Southern California, star power ruled the day, bringing out the largest crowd at Hollywood Park since 2001. That’s about triple a standard weekend crowd at Hollywood and about double what a Zenyatta “retirement party” drew last year after the Breeders’ Cup. 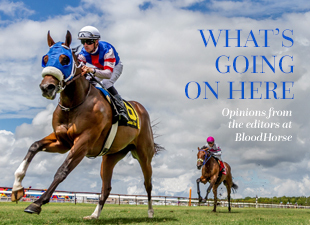 If there has been an upside to the downturn in bloodstock prices over the last few years, it’s that racing’s top players have stayed in training another season rather than being hustled off to stud. As long as racing can maintain its ability to challenge gamblers with a high-quality game of skill that churns out eight-figure handle days, can offer a sought-after social scene, and keep some of its brightest stars in training, then the future of racing in North America remains bright.